"Now, more than ever, New York is America's city  a symbol of our indomitable spirit, our energy, our roots in a proud past, our confidence in the future. Is there any place in this fair land that better symbolizes the glamour and drama of the American life than New York, 5th Avenue'." 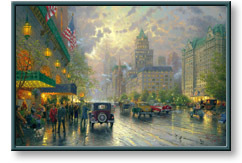 Image Size: 40" x 60"
New York, Fifth Avenue copyright© 2003 by Thomas Kinkade is prohibited from being copied.